Pest UK / Pests / Are Squirrels Pests? At PESTUK we are often asked “are Squirrels pests?” our answer is that grey squirrels are considered an alien species and classed as vermin and therefore can be treated by us. Common complaints from Squirrel infestations is when they take residence in loft spaces. They can make a tremendous amount of noise and are much more destructive than rats or mice. They will enter loft spaces for shelter or as a breeding site. A male squirrel will have several dreys (nests) within his territory, usually in trees but some times in buildings. Squirrels can be pests in gardens as well and can do damage to bulbs, plants, trees and eat birds eggs and young birds. Since their introduction to Britain in a number oflocations between 1876 and the 1920s, grey squirrels have spread and bred rapidly. They have displaced the red squirrel through England and Wales and in central and southeast Scotland. Grey squirrels in the wild cause damage to trees with some of their behaviour. This includes bark stripping, this behaviour only takes place between April and to the end of July. Bark stripping makes branches weaker and more likely to be broken off by wind or animals and can lead to secondary infection that can lead to death. These squirrels also share some of the responsibility for the decline of certain woodland and songbird species, this is due to feeding on eggs and young chicks. 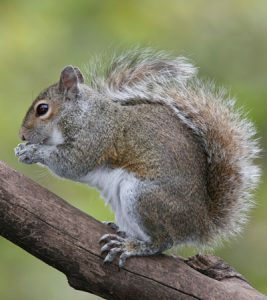 Grey squirrels in the UK have helped with the decline of the native red squirrel this is due to grey squirrels spreading the poxvirus, causing scabs and lesions on the face, feet and eventually death. Due to the increased mortality of reds from this virus greys have spread faster through the country. It is illegal to release grey squirrels into the wild. PESTUK upon beginning a treatment will lay traps in a loft or a garden. For this reason traps must be checked on a daily basis to ensure there is no suffering caused. If found then you must call our office straight away.